Hi everyone another freebie for you today. This is on the same theme as the Merry Christmas Stars Card which seemed quite popular and is in response to a request from Lenoria - hope you like it. I'm still struggling on with my sick PC but am getting a new one on Thursday so no doubt it's going to take me quite some to get everything moved over, just hope it will be an easy transition and I can get back to being more creative again soon. Anyway here is the card. Please leave me a comment of you download the file. Thank you Shirley!! I am going to try this out as soon as I get back home from picking my granddaughters up from school. I hope your transition to your new computer goes smoothly and everything works even better than you even imagine. This is a nice versatile design. Thank you and good luck with your new PC. Merci Shirley pour cette belle carte . Absolutely fantastic! Thank you so much for sharing. 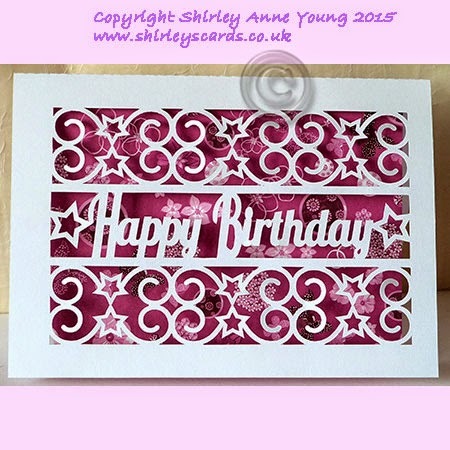 Shirley another fab design, love the boders of this. Thank you so much for your continuing generosity. Thank you very much for this wonderful file! It is so pretty! This is fabulous. Thank you so much. What can I say? Thank you!!! Bello! Bellissimo! Bellissimissimo! Thank you Thank you and Thank you for all your beautiful files. I Love them All! May I share your site on FB for all to see? You are so talented and kind to share your creations. When I make them I will share your link on my blog. Thank you again! Pleased you like them and I'm happy for you share my site on FB. I have only just discovered your site and it's great. I have just bought a couple of the patterns. I think this one will be a fun one to try. Thank you I needed a nice card that suits everyone! Tank you for this great card ! Thank you Shirley for the pretty card! Great feminine or masculin card. Thanks. Thank you Shirley, for the free svg. I can't wait to make it! Thank you for the free svg file, Shirley. I will enjoy making this card and my friends will love receiving it. Thank you! Can't wait to give this a try. Thank you Shirley, this is beautiful. Thank you! I'm using this for my first svg project! Thank you, this is my first bday card. I love it! I just found your site. Thank you for this lovely card.